A young tourist woman takes selfie photo at the Colosseum in Rome, Italy with smartphone smiling, laughing. Slow motion. 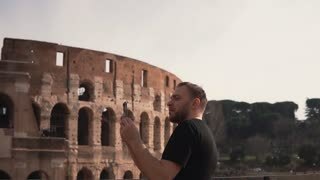 Tourist woman takes selfie photos at Colosseum in Rome, Italy with smartphone. Girl runs down the steps. Slow motion. 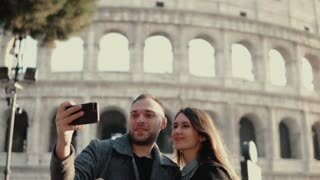 Young happy woman takes selfie on her smartphone in Rome, Italy, enjoying the trip, watching the pictures. Slow motion. Tourist woman takes selfie photos against the background of the Colosseum in Rome, Italy with smartphone. Slow motion. 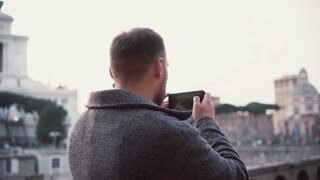 A handsome man visiting Rome, Italy, takes photos near the Colosseum. Guy enjoys the trip, architectural. Slow motion. 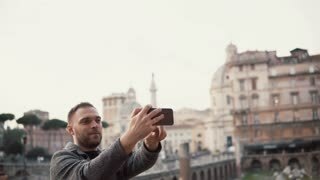 Tourist man takes selfie photos against the background of city centre of Rome, Italy with his smartphone, smiling. Young attractive woman and man standing near the Colosseum in Rome, Italy. Couple takes the selfie photo on smartphone. Young brunette tourist exploring the Colosseum in Rome, Italy. Woman takes the photo of sight, uses smartphone.